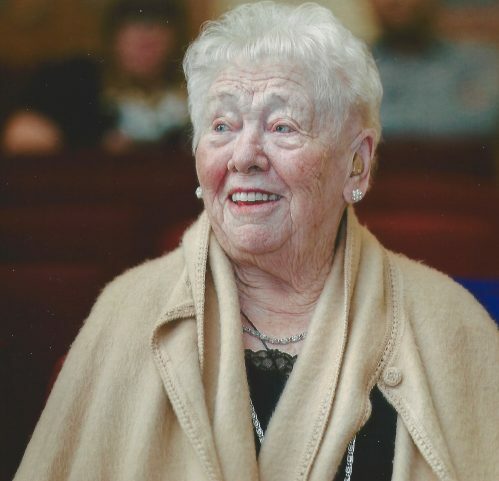 It is with great sadness that the family of Alice Vernice Rose Wearmouth (nee Towers) announce her passing in Cochrane, AB on Sunday, April 15, 2018 at the age of 97 years. She is survived by her three children; Doug (Cheryl), Irene (Arvid) and Edith (Ken); her grandchildren Matthew Wearmouth, Lauren Wujcik, Lukas (Lana) Aasen, Sara (Devin) Karlstrom, Travis (Kara) Eklund, Shane (Amanda) Eklund, Lori-Anne (Danny) Forbes and her nine great grandchildren. Vernice is also survived by her brother and sister-in-laws Shirley (Bob) Thomas and Dennis (Maida) Wearmouth. Vernice was predeceased by her husband Hugh in 2005. Vernice lived her whole life in the Cochrane area. A celebration of her life will be held at St. Andrew’s United Church (128 – 1st Street East, Cochrane, AB T4C 1Z3) on Friday April 20, 2018 at 1:00 pm. In lieu of flowers donations can be made to the Cochrane Bethany (1000 – 32 Quigley Drive, Cochrane, AB T4C 1X9), St. Andrew’s United Church in Cochrane, or to a charity of your choice. The family would like to thank the staff at the Cochrane Bethany who gave Vernice excellent care while she resided there for 13 years. Our condolences. We first met Vernice back in the early 90s through St. Andrew’s and always appreciated the sparkle in her eyes and her warmth. A lovely lady – we will miss her. Dee and I were sorry to hear about your mom’s passing. You know that your family has always had a special place in our hearts. Dee, I and the six daughters were always welcome in your home. Memories of branding time, of riding horses( which I never mastered)and of the great meals that your mom and grandma put on the table. We will remember these great times. Our thoughts are with you as you celebrate the life of this wonderful lady. I wish we could be there Saturday. Our deepest sympathy to all of your family. Our thoughts are with you. Deepest Sympathy to all of the family, thinking of you as you celebrate the life of a beautiful, talented lady. Doug,Irene, & Edith so sorry to hear of your Mom’s passing. So glad I had a short visit with her when we looked at the Bethany for Dad. Unfortunately I can’t be there on Saturday but will be thinking of you all. Edith, and to all of your extended family, please accept our family’s heartfelt condolences on the passing of Vernice, such a sweet person. We all have such fond memories of her, whether it was at branding time, helping out with meal preparation at the Church Fall Suppers; even being our son Daniel’s ‘Special Grandma Friend’. She touched all of us in many ways. To hear her play the organ or piano in church, helping out with the choir at Christmas time or putting on various Cantatas that we participated in was something I’ll never forget. Your family along with the entire community of Cochrane was truly blessed by her Love and Compassion towards all of us. This brief note is to express sincere condolences to Edith, Doug, and Irene on passing of their mother Vernice. We are very grateful for the warm and friendly relationship we had with Vernice and Hugh when in the 1982/86 years we were neighbours directly across the road from their home. Doris treasures her leisurely strolls with Vernice on the ranch and down along Jumpingpound Creek. She also fondly remembers the carefree and relaxing golfing with Vernice at the local courses. Jim recalls Vernice being angry with him when we agreed to be relocated to Saskatoon in August 1986. With much love. Doris. Our condolences to you all, in the loss of your mother and grandmother. We being distant cousins (from the west coast of BC) will always have pleasant memories of Vernice (with Hugh), as always making us feel very welcome in their home. Like others who have written, we were honoured with their friendliness and in allowing us city folk to experience the real country life on the ranch. Horses, cattle and land are remembered and treasured! It’s true, goodbyes are not forever, we will meet again. We were so sorry to hear about the passing of your Mom. Even though we live in B.C. our visits to the ranch were always a special time. We will always treasure the memories of your Mom and Dad. We were fortunate to receive one of Vernice’s beautiful guilts. It is surprising how often it makes us think of her and the wonderful lady she was. Our love and sympathy to you all.